L: 89" x W: 37" x H: 39"
Westcott Sofa Indulge your love for contemporary design with the Westcott sofa. Made for easy, everyday living, it’s upholstered in a sumptuously soft fabric with a hint of herringbone texturing. The divided back design puts pillow plushness and support right where it’s needed most. Overstuffed pillowed armrests are the stuff dreams are made of. Indulge your love for contemporary design with the Westcott sofa. Made for easy, everyday living, it’s upholstered in a sumptuously soft fabric with a hint of herringbone texturing. The divided back design puts pillow plushness and support right where it’s needed most. Overstuffed pillowed armrests are the stuff dreams are made of. Hi. Firstly I would say that this product is exactly like how it looks in the picture. After reasersching so much in the other shops i happened to visit this store. Wasn’t aware of this outlet earlier. This store has very good products for a reasonable price. This sofa really has comfortable cushioning . I am very much impressed with the material they used. Soft fabric and worth the price. I also would like to mention that the representatives in the store are very nice and pleasing. This product was delivered to me within three days. Their pricing technique is really impressive. Worth buying any product in this store. This is the best couch I have ever owned. It's very chic and comfortable. The color is absolutely gorgeous and the material is so soft. The back support is amazing and the seating sits up pretty high. I'm 5'2 and my husband is 6"3 and it fits us both perfectly. We ordered on a Friday evening and we were sitting on our new couch Monday afternoon. Great price, and so soft and comfortable! Delivery people were stellar. The purchase process was a bit tedious - first the sales person, then the cashier, then five (!) followup calls in two days to confirm the delivery date. The most important call - telling us the time frame for delivery - never came, so I had to call customer service. But overall, we are happy with the couch, and hopefully it will last a long time. After looking in several stores I happened upon this couch at Raymour. I sat on the corner cushion (I'm 230 lb.) and noticed no sagging towards the arm and kind of cozy. Which suggested that the support quality is better than some sofas costing twice as much. I bought it and so far very happy. Unfortunately, midnight blue is the only color. Family love the firmness of the couch. The fir was perfect for our living room. A great price; comfy; and beautiful! I saw this offered online under clearance. It looked really nice. It wasn't in store, just warehouse, so I took a chance and ordered it. It was just like the photo. It looks really good in my living room! Also, a beautiful blue color. They delivered it and put in place for me. love it!..it's a little firm, but that's a good thing, since i believe it will last longer, not that i have ever been disappointed with any purchases i have made..the color is a rich saphire blue, which looks great in my gold room..another happy purchase~! I love my new furniture pieces! It was just what I expected. The set fit in my living room perfectly. The color is fantastic. Great furniture, comfy and quality built. Entire experience was great service from ordering to delivery. I really like the size and sturdiness of this sofa. Got this couch by visiting the store and trying out all the couch sets there. This was probably the most comfortable one in the store. Pros: material is soft, comfortable, soft, color is stain resistant. Cons: bulky, need cushions for lower back if you are sitting on it for a long time. Would recommend it. It is nice soft fabric but a bit cheaply put together. The plastic legs were almost impossible to get on. Very frustrating:/. I guess you get what you pay for. I don’t recommend this sofa at all the cushions keep coming off and you feel the frame because is not cushion properly. Very disappointed . Too expensive for the quality . This is a wonderful sofa. Very comfortable - nice and firm. I would be happy to buy my furniture at Raymour and Flanigan again. It is affordable, high quality and an excellent piece of furniture. It is soooooooooooo comfy. I keep telling myself not to lay down on it or I'll be asleep in a few because it's so comfortable. And it's so soft. We stopped in the store to look for a couch for our family room. This one is very comfy! Wish it was offered in other colors, but the dark navy does look good in our room. Salesperson Jamie was quite helpful without being pushy - just the right balance of attention. 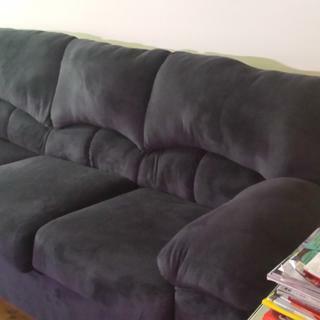 This is one of the most comfortable couches I have owned, and I like the navy color . 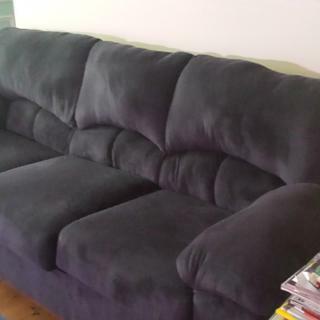 Great, comfortable couch that's perfect for a family. The cushions are a little firmer than expected, but I've grown to like it more than a soft couch. The backs/armrests are super plush and nice though. Love the couch set, but loved my deliver guys more. Shout out to the guys who delivered twice for me! Couldn't ask fo better service. This sofa is also extremely comfortable as well as it's adding great looks to my living room. The quality is there, and the fabric appears durable and easily cleanable. My wife and I are very happy with all the furniture peace’s we purchased last week! We love our new couch. Great quality with amazing prices. Thinking about buying the matching love seat! The gentlemen who delivered it were also really nice and it was maybe a 10 minute process. I would recommend it to my friends as well. Shipping was quick and easy as well. I like the one in the store better than mine. The store model was more comfortable and straight on the back rest - top. My sofa is not "straight" along the top, but yours is. Why? Because the delivery guys messed up my door and wall? do you remove old sofe and is there a charge? BEST ANSWER: It is a very dark blue color. Its very comfortable and my family loves it. If we come to the store can we see this sofa nd try it out? BEST ANSWER: The Westcott Sofa is an outlet item, so it's not in any of our R&F stores. is this piece on display in the showroom? BEST ANSWER: The Westcott Sofa is an Outlet item as on display at a Raymour & Flanigan Outlet Center. Does this sofa come with decorative pillow? Is this sofa more of a gray or beige? BEST ANSWER: The Sofa I purchased was midnight blue. I paired it with a gray rug. What's the material of the sofa ? BEST ANSWER: Hello David, thank you for your interest in the Westcott Sofa! This is made up of 100% woven polyester. It is not a microfiber fabric. I previously say it in gray. is gray still available? BEST ANSWER: The Westcott Sofa is only available in Midnight Bronze which is a dark blue as shown. It does not come in a gray fabric color. Is it a very deep couch? I would like to not have to jump into to have back support? BEST ANSWER: The seat depth is 19.5"
I'm not familiar with the color Midnight Bronze. It appears dark blue on my screen. Is that accurate? BEST ANSWER: That is correct. The Midnight Bronze color is a dark blue. How wide of a door does this sofa need? Can it fit through a 32”? 32" would be wide enough. My doorway measures 30" an I did not have any problems. Yes because when it comes the legs is not on . So yes it will fit . What is the upholstery made of? Is it easy to keep clean? BEST ANSWER: The Westcott Sofa is made up of 100% polyester upholstery. It is simple to clean, here are the recommended cleaning instructions: Lightly brush or vacuum frequently to remove dust. Do not use water- or solvent-based cleaners. A professional cleaning service is recommended for an overall soiled condition. BEST ANSWER: Yes, the seat cushions are removable. The seat backs are attached. Is it soft and comfortable? BEST ANSWER: While it's a personal preference, the Westcott Sofa is more of a soft and comfortable sofa.